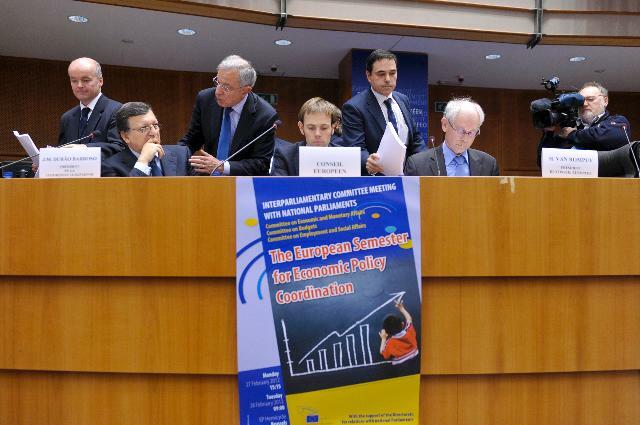 Herman van Rompuy, 2nd, Luuk van Middelaar, Member of cabinet of Herman van Rompuy, 4th, Alain Lamassoure, Member of the European Parliament (EP) and Chairman of the Committee on Budgets, 5th, and José Manuel Barroso, 6th (from right to left). From the interparliamentary committee of EP meeting with National Parliaments on “The European Semester for Economic Policy Coordination.” Barroso made a speech entitled “Unity in difference, strength in convergence”. According to a Eurostat analysis of EU27’s household final consumption expenditure, the Baltic countries and Greece are still suffering most from the economic and financial crisis. The two authors of the report, Christine Gerstberger and Daniela Yaneva, stress that consumption is a key indicator of citizens’ well-being, with housing, energy, transport and food accounting for about half of total household expenditure. The study uses data on the development and structure of expenditure, to identify trends over the past decade. For instance, the impact of the economic and financial crisis on actual individual consumption of households was relatively moderate, as rising government consumption counterbalanced at least partly a more significant contraction in household consumption. While the Baltic economies suffered most in 2009, household spending continued to decline in Greece due to the deepening recession. The fall was sharpest in 2011. Consumption in Greece is thought to decrease even further during the period of 2012-2013. Despite some general trends in EU-27 data, detailed consumption patterns vary significantly between Member States and the impact of the crisis on specific expenditure categories was also quite varied. The report found that differences in the level of individual annual consumption per capita in euros are large, ranging from 35,000 euros in Luxembourg and 29600 euros in Denmark to 6,400 euros in Hungary in 2011 (respectively 3,400 euros in Bulgaria and 4,200 euros in Romania based on last available data for 2010). However, this spread is more than halved when differences in purchasing power are taken into account. Even halved those differences of consumption expenditure are infallible witness that the EU27 in not a standard club but rather an association of fundamentally different economies. Consumption differences of this order are not of quantitative character but reveal qualitative gaps between the 27 member states. In many EU regions or for certain population minorities, incomes and consumption patents resemble more to developing or even underdeveloped counties. Exclusion is the name of game not only for households belonging to special groups, like Roma or the growing numbers of homeless. Large percentages of agricultural households in central and southern Europe live in conditions of subsistence agriculture, cut off from markets. On top of that one should add to the category of complete exclusion, large parts of city-dwellers with nominal or not standard incomes at all. Huge parts of big cities conglomerates fall in this category. In such an environment the on-going financial crisis in Europe has hit harder the countries under IMF-EU-ECB programmes, that is Greece, Portugal, Ireland and the Baltic economies. According to the above mentioned Eurostat report of them all, the Baltics and Greece were the most severely affected, with loss of actual individual consumption (in volume terms) of 12% to 15% between 2008 and 2011. While actual individual consumption started to recover in the Baltic countries in 2011, the contraction accentuated in Greece, in connection with the deepening recession and debt crisis, so that the losses between 2008 and 2011 increased to nearly 15%. Obviously the Greek vicious cycle is thought to continue also during the two year period of 2012-2013, with further reduction of incomes and consumption. In Romania, Hungary, Bulgaria, Ireland and Poland actual individual consumption also fell by between 5% and 9% from 2008 to 2011, while it expanded by between 5% and 8% in Luxembourg and Sweden and other rich EU member states. The apparent conclusion is that the European Union is regrouping countries and regions of so large income and consumption differences, that the club cannot be considered as a uniform economic space. It is obvious then that special economic measures are needed to draw large parts of the EU’s peoples and regions out of the present misery. The tools used so far (all kinds of the EU Commission grants in support of projects or organisations) have not managed to bring about a reduction of inequality, within the EU. All that without saying anything about the huge differences in employment opportunities between member states, that in certain countries deprive more than half of the young generation of any prospect.